1. Are your products really made in the USA? All of our label raw materials are made in the states. Our primary material supplier has several manufacturing centers on the East coast. All of our printing and finishing is performed here in Oregon. 2. 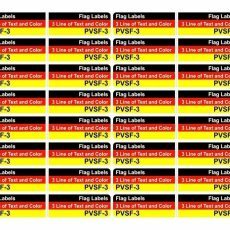 What is the best label for marking cylindrical items? Depending on the diameter of the item, our Wide Rectangular typically is the go to size. It is designed to wrap around onto itself, providing a secure attachment. For large cylinders like a water bottle or thermos, the Narrow Rectangular work well. 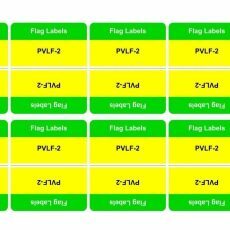 For cylinders less than a pen in diameter, our Small Flag labels may be used. These can be used in two ways: as they are printed they fold around the cylinder and extend off of the cylinder like a pendant, or you can cut then in half and wrap around the item in a similar manner to our Wide Rectangular labels. 3. 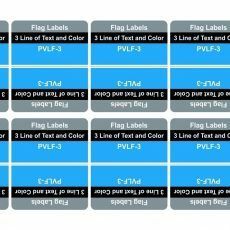 Do you call them labels or tags? Either works for us. You will find both in use in our communications and on our site. 4. How long does it take to get my order? Typically an order will ship 2 business days after received. It depends on our production schedule. Our busy seasons where production can get backlogged are at the end of the year and in the spring. If we are experiencing production delays, we will post it a notice on this site. If there is a delay in an order, we will contact you. Once complete, we ship via the Post Office. See this link for approximate times. 5. Do you offer expedited processing? 6. Do you sell to government agencies or other institutions? 7. Do you offer custom sizes or quantities? In short, yes we do and we would have an order minimum depending on what work is involved. Tell us what you are looking for at info@TagYourGear.com. 8. I’ve wrapped my label on a small item and the edge of the label is lifting up, what do I do? Our labels use a pressure sensitive adhesive and they need pressure and time to cure. The stiffness of the label can cause the edge to lift after it was recently applied. Additionally, some surfaces and materials are not as easy to stick to as others. An easy fix for this is to apply the label, press firmly for several seconds, then wrap the label with masking tape, rubber band, string, spring clip, or anything that would hold the problem edge down over a 24 hour period. The adhesive will likely be cured enough to hold the position within 12 hours, but varies with ambient temperature and humidity so we recommend 24. 9. How are your labels any better than the Avery labels at the office supply stores? There are several reasons why our labels would out perform those store bought blank labels. Better Adhesive: Material wise, one can find similar materials at the office stores. However our labels have an adhesive developed for outdoor use on metals and plastics that are not the easiest to adhere to, where the store bought labels have general purpose adhesive. Durable outdoor quality ink: The store labels also would require you to design and print on your own printer. Home laser and inkjet printers work well on these labels, but the inks are not intended to be exposed for long periods outdoors. Outside, UV rays will tend to fade the ink from those printer, where our ink is designed with UV stablizers and formulated to withstand years in UV light for outdoor signage. Time Spent: Considering your time spent creating your designs in the label template, printing the labels, laminating, and trimming the laminate you might not be saving that much money. Typically the template in your editing software will not print perfectly on the label material so you end up wasting several sheets/time and may end up changing your design to make them work. Size options: You are limited to sizes that generally are larger than ours. 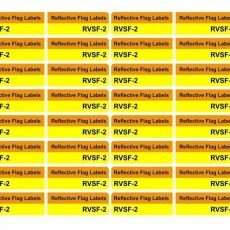 Inferior Reflectivity: If you are looking for reflective labels, our reflective label material is of the highest retroreflective product available. You will not be able to find comparable reflectivity in a store bought label that you can print at home. In fact you will be hard pressed to find anyone printing short runs on the material that we use. 10. How are you different than the multitude of other online custom label printers? We started with the gear, and out of necessity started printing the labels. Our labels are designed to be used on gear and aid in uniquely identifying it. Everything in the label from material selection to processing machinery was selected to provide labels that meet the demand for gear the is exposed to weather, abrasion, and abuse.